Advocates, union leaders, and politicians on all sides of the Janus v. AFSCME debate wasted no time jumping in after the Supreme Court ruled Wednesday morning that teachers and other public-sector employees who disagree with their unions no longer have to pay fees that support those policies. President Donald Trump tweeted that the court “rules in favor of non-union workers who are now, as an example, able to support a candidate of his or her choice” and called the ruling a loss for Democrats. While the question of public-sector unions using agency fees to endorse specific candidates was not at stake in the Janus case, the arguments did raise the question of whether all issues that unions negotiate are inherently political. Justice was served with #JanusvAFSCME ruling. If you want support for your speech, it must come voluntarily. Simple principle, needed to be upheld. Former education secretary John King tweeted an article written by Weingarten, the American Federation of Teachers president, that said teachers want their voices heard. Weingarten tweeted that the union will remain strong despite the ruling. 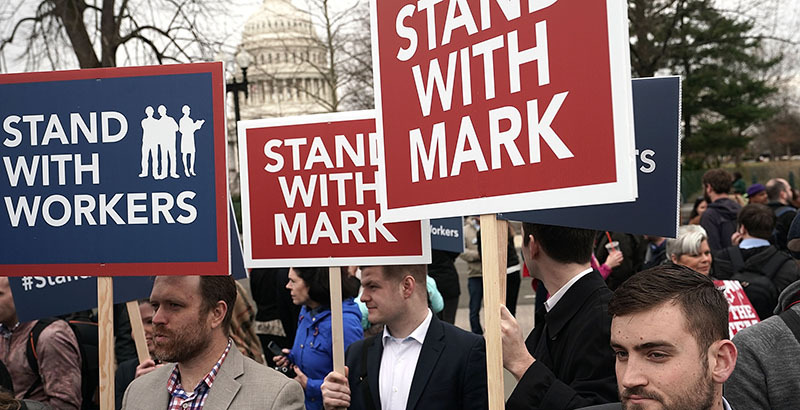 Erika Sanzi, a parent advocate and visiting fellow at the Thomas B. Fordham Institute, a conservative think tank, responded, noting that polls indicate that a majority of Americans believe union members should not have to pay mandatory dues. Many Democrats took the opportunity to express their support for unions overall. President Eisenhower, a Republican, said back in 1952: "Only a fool would try to deprive working men and women of the right to join the union of their choice." In yet another 5-4 ruling due to a stolen seat, SCOTUS just ruled against workers and in favor of billionaires. The #Janus ruling is a setback, but it is not a defeat. Keep organizing, mobilizing, and demanding more good paying #union jobs. Other critics charged that the case was bankrolled by wealthy conservative donors and the result of a “stolen” Supreme Court seat, a reference to Senate Republicans’ refusal to confirm President Barack Obama’s nominee in 2016, holding the slot open for a conservative justice. SCOTUS shamefully decided to side with anti-worker billionaires over working families today. Then, to cap off the final day of the court’s current session, Justice Anthony Kennedy, who sided with the majority in the Janus ruling, announced that he will retire effective July 31.